MIM: Islamists have jumped on the ecology bandwagen and are holding and participating in events worldwide. The 'liberal facism' and 'totalitarian progressivism' which characterizes the 'Green Movement' explains why many Islamist Muslims are members or leaders of Green parties worldwide and epitomizes the Red-Green alliance. "The mission of the Committee shall be to foster collaboration and exchange with Green parties around the world; to facilitate official GPUS representation on the international and global level; to facilitate GPUS issue and policy development on the international and global level; and to network with green organizations and movements working on the international and global level." MIM: An article in the Green Party's official "Green Paper" explained the similiarities between the Islamist weltaanshaung and that of the Green Party. "...In a recent survey by the Council on American-Islamic Relations (CAIR), Muslim respondents were asked which political party best represents the interests of American Muslims. A quarter of those polled identified the Green Party. Many affinities also exist between Greens and Muslim-Americans who don't immediately identify with the Green Party. The Green Party has embraced political positions more consistent with the American Muslim viewpoint on civil liberties, U.S. support for the Israeli occupation of Palestine and the war on Iraq. Among a host of other issues of affinity are gender and environmental justice, not often thought of as Muslim issues in today's prevailing Islamophobic climate..."
"...To what extent do Muslims identify with Green Party candidates and why? To what values, beliefs and ideals do self-identified progressive Muslims and Greens share a common commitment? How can that common commitment be employed and emphasized in our efforts to swell the ranks of the Green Party with members of the Muslim-American community? 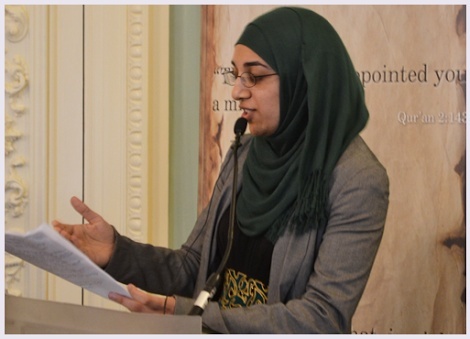 To learn more about the discussion and about the political diversity of the Muslim-American community and its activist organizations, look for the upcoming report from the Green Crescent Initiative, to be published in late December. A copy of the full report will be posted on the GPAC website: http://www.cagreens.org/alameda/county/. .."
In a 2014 press release the Green Party's virulent anti semitism and hatred for Israel was clear. "..The Green Party of the US has called for boycott, divestment, and sanctions against Israel until it complies with international law and UN directives, ends the occupation of Palestinian lands, and observes full and equal human rights for Palestinians, including the right of return..."
MIM: On September 21st CAIR joined with other radical Islamist organisations and individuals to take part in the "Climate March" in New York City. Below is an account by Jacob Bender the Executive "Dhimmi" of CAIR Philadelphia. "This past Sunday, Sept. 21, I was privileged to join over 400,000 of my fellow human beings in the largest demonstration in history to warn of the dangers of climate change to future life on earth. I marched with the Muslim contingent, composed of people from CAIR-Philly, CAIR-NY, ICNA, ISNA, Islamic Relief, Majlis Shura of NY, Muslim Consultative Network, Al-Khoei Foundation, Greenfaith, Muslims Giving Back, Muslim Boys Scouts, Arab American Association of NY, MSAs, and MAS. Click here to see more photos of the March, especially the Muslim contingent. Dozens of religious groups met on West 58th Street before the March for an inspiring interfaith service, where one of the speakers was Imam Zaid Shakir, the keynote speaker at CAIR-Philly's 2014 Banquet. Watch Imam Zaid's speech: (click on link below). See an amazing aerial image sequence of the crowd. MIM: A website called The EcoMuslim preaches "ecojihad". #EcoIslam news, environment tips and Green Muslim lifestyle from British Muslim Zaufishan Iqbal. "As-salam`alaykum, greetings of peace, respect and eco-jihad." MIM: The Al Qaeda linked Muslim American Society started a Muslim Green Team project. Muslim Green Team is a campaign of the Service Corps department of the Muslim American Society (MAS). It began in 2008 in the Bay Area chapter of MAS. MAS believes that living a "greener" lifestyle is not only healthier and socially responsible, but an essential and mandatory component of a Muslim's life. To this end, MAS Service Corps established Muslim Green Team. It is a comprehensive, grassroots (pun intended! ), environmental campaign, promoting environmentally conscious and sustainable practices in all spheres of human activity. To fulfill our duty to Allah (swt) in adopting environmentally friendly practices. To contribute to the increasingly global effort to reverse the effects of environmentally-irresponsible practices. To raise awareness about environmental issues within the Muslim community. To demonstrate the environmental message of Islam. To contribute the unique, Islamic perspective of the environment to the national and global environmental conversation. MIM: In the UK the Muslim Council of Britain's Affiliate the innocuously named Made in Europe (The MCB is the UK equivalent of CAIR) held an EcoFair at the Regent's Park Mosque which is notorious for their Islamist ties. "In a large balcony above the beautiful main hall at Regent's Park Mosque in London - widely considered the most important mosque in Britain - I am filming undercover as the woman preacher gives her talk. What should be done to a Muslim who converts to another faith? "We kill him," she says, "kill him, kill, kill…You have to kill him, you understand?" Adulterers, she says, are to be stoned to death - and as for homosexuals, and women who "make themselves like a man, a woman like a man ... the punishment is kill, kill them, throw them from the highest place". These punishments, the preacher says, are to be implemented in a future Islamic state. "This is not to tell you to start killing people," she continues. "There must be a Muslim leader, when the Muslim army becomes stronger, when Islam has grown enough." A young female student from the group interrupts her: the punishment should also be to stone the homosexuals to death, once they have been thrown from a high place. These are teachings I never expected to hear inside Regent's Park Mosque, which is supposedly committed to interfaith dialogue and moderation, and was set up more than 60 years ago, to represent British Muslims to the Government. And many of those listening were teenage British girls or, even more disturbingly, young children..."
"...The director general of Regent's Park Mosque is Dr Ahmed Al Dubayan, a Saudi diplomat..."
On Saturday 6th September, MCB's Affiliate, Made in Europe will be holding the biggest MADE event of the year – the 2014 #EcoFair at Regents Park Mosque - where they'll be promoting all things green and ethical. Why not enjoy the last of the summer sun before the gloom of winter with the MADE crew! From cupcakes and creativity to speakers and smoothies we have it all! Come along with your family from 12-5pm to meet new people, share exciting ideas and learn about the wonderful world of all things green and ethical! Launch of the "Green Masjid Project"
ISNA's Masjid Development Committee announces the launch of the "Green Masjid Project" led by a Green Masjid Task Force under the chairmanship of Brother S. Masroor Shah, a long-time leader in ISNA and his local community in Evansville, Indiana. The purpose of the "Green Masjid Project" is to (1) raise awareness of issues of conservation and Islam's strong support for the principles of being stewards (khalifah) in the earth and Islam's call for us to be an eco-friendly community, (2) develop standards for transforming existing masjids into green masjids and then work to make more of our masjids eco-friendly, (3) develop standards for building masjids that meet the goal of being a green masjid, and finally (4) promote the practice of a green Ramadan. The Task Force welcomes the opportunity to come to your community to talk about the ideas of being an eco-friendly community. In particular Brother S. Masroor Shah is willing to present a lecture at your masjid. Please contact Ihsan Bagby at [email protected] for more information. The Green Masjid Task Force presently consists of S. Masroor Shah, Saifuddin Ansari, Uzma Mirza and Ihsan Bagby. If you are interested in joining this Task Force please contact Ihsan Bagby at [email protected]. Exactly 25 masajid to date have joined the Greening Our Ramadan campaign, pledging to (1) conserve food at iftars and avoid being wasteful by giving excess food to people in need; (2) use biodegradable products for iftars and not Styrofoam cups and plates; (3) recycle material, especially plastic water bottles; (4) replace all light bulbs with energy saver bulbs and thus conserve electricity (if financially possible at this time); (5) give a khutbah on the Islamic imperative to conserve and protect our environment. Some of the pioneering masjids that signed up early are: Islamic Society of Central Jersey, Spokane Islamic Center, Islamic Association of Carrollton (Dallas area), Masjid as-Sabur (Las Vegas), Dayton Mercy Center, Islamic Center of South Jersey, Masjid al-Fajr (Indianapolis), Muslim Community Center (Indianapolis), NW Indiana Islamic Center and Islamic Community Center (Lancaster, PA). There is still time to sign up. Click here to sign up and get more information. The Greening Our Ramadan campaign was endorsed recently by the Association of Muslim Chaplains whose President is Dr. Salahuddin Muhammmad. Other endorsers of the campaign are the Fiqh Council of North America and the North American Imam Federation, led by Dr. Omar Shahin. A recording of our webinar and accompanying slides are now available online. Presenters included Nana Firman, Saffet Catovic, and S. Masroor Shah. "...The Declaration presents the moral case, based on Islamic teachings, for Muslims and people of all faiths worldwide to take urgent climate action. It was drafted by a large, diverse team of international Islamic scholars from around the world following a lengthy consultation period prior to the Symposium. It has already been endorsed by more than 60 participants and organisations including the Grand Muftis of Uganda and Lebanon..."